Go Cable, LLC is the premier data cabling contractor, serving businesses throughout Clearwater, FL and the surrounding areas. We provide network cabling installation, as well as cabling for voice and data systems. We are experts in troubleshooting issues and are happy to work through any cabling troubles you are having to get everything back up and running smoothly. Bringing more than 20 years of professional experience to every project, Go Cable, LLC is proud to be a trusted cable installer in Clearwater, FL. When it comes to voice and data cabling for businesses of all types and sizes, we strive to provide nothing less than the best. Our capabilities encompass any cabling needs your business might have, from voice and data, to fiber and coaxial—even surveillance systems and cabling for overhead speaker systems! We can even rip out old cabling before installing newer, up-to-date cabling for your business’ update or renovation. We approach every cable installation in Clearwater, FL with foresight for the complete job. This means pinpointing obstacles, anticipating the steps for the job, gathering the right resources and more. The result is a well-executed project that goes off smoothly, with results that simply work for our customers! 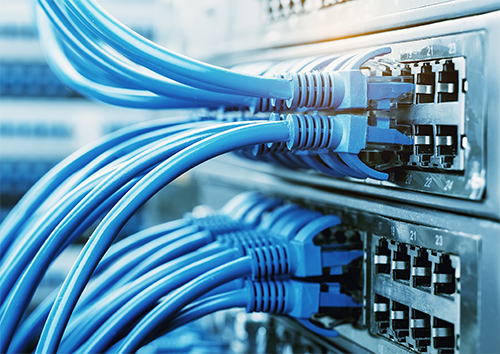 From new cabling installed to existing cable relocated, networks programmed to troubleshooting for transmission problems, count on us for a complete range of reliable services. We focus on delivering exceptional customer satisfaction at the end of every job and take every precaution to guarantee our work. Contact us for your next cabling project and experience our expertise and penchant for satisfaction firsthand. We’re a local, owner-operated company, familiar with the cabling codes and guidelines of our service area. Our focus is always on providing customers with the highest quality work and support, to ensure maximum value. Thanks to a careful approach to planning and execution, we’re able to execute jobs cleanly and quickly, without compromising our high level of service. We’re experienced in laying CAT 6, CAT 5E and CAT 3 cabling, as well as coaxial cable for voice and data systems. We can also provide cable demolition, to ensure any preexisting or old cabling is properly removed and disposed of. From voice and data cable installation to network cable testing and even cable demolition, we’re your authority on cabling projects big and small. Contact us today for more information.